When the clock hits 0:00 on the college basketball season, sports fans everywhere know it is tradition to conclude the year with “One Shining Moment.” And just as the playing of “One Shining Moment” signifies the summit of college basketball, so does NBA Draft Night signify the beginning of next chapter for declared athletes. These two hallmark moments give prospects a platform to share their personal stories with all eyes on their talents. But what about the moments between the moments? No longer under the umbrella of the the NCAA, yet still without a team and city to call home, these future pros had the opportunity to engage with their fans, as both players and people. In evaluating how the top prospects in this year’s NBA Draft took advantage of this period of time, we took an extensive look into their social media habits and effectiveness of their outreach. 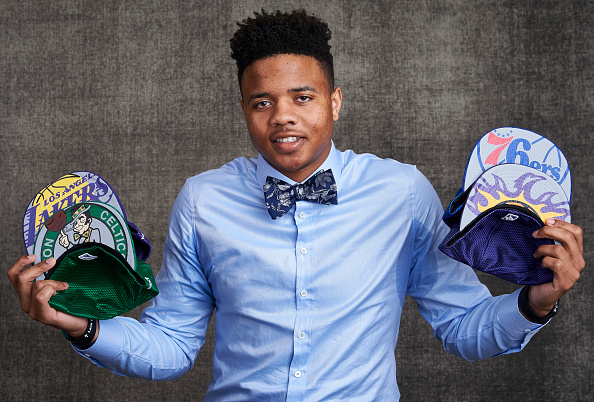 The prospect that rose to the top: Markelle Fultz. In addition to becoming the #1 overall pick in the NBA Draft, Fultz stood out for his ability to actively engage current and new fans through social media over the past few months. What makes Fultz’s case notable starts with how he was perceived in college. As the consensus #1 pick throughout the majority of the college basketball season, Fultz was still relatively unknown considering his massive talent. Playing for the University of Washington, Fultz’s only year in college was for an 11th-placed team based in the Pacific Northwest. Without the opportunity to showcase his talents on a larger stage in the same manner as his peers, Fultz was still able to grow his social media presence and overall fan engagement significantly since declaring. For example, in looking at Fultz’s habits on Instagram, there was a significant shift in the type of content he shared. From his first game during college season until his announcement that he was declaring for the NBA Draft (Nov. 13 – March 15) Fultz posted on 35 occasions, with over half of those posts being in-game photos. In nearly the same amount of posts since his intention to go pro was announced (31 posts), only five focused on Fultz strictly on the basketball court. Along with pre-draft workout posts, his content included the NBA Draft lottery, photos with friends and family, and other content that highlighted different interests. While he may not have dominated the day-to-day conversion like some of his peers, Fultz saw his engagement numbers grow steadily. When measuring three primary social media platforms (Facebook, Instagram and Twitter) through social media intelligence company HubNami, Fultz saw his social media engagement grow at over 118% over the past month (this is a combination of likes and comments). For comparison, only one other projected Top-10 pick topped 50% growth in engagement, with many of the projected Top-10 were seeing a decline in engagement during the same period. Not surprisingly, interest in Fultz grew after the Philadelphia 76ers announced it would move up in the Draft with the assumption they would be selecting Fultz. As the buzz continued to grow, the eventual first overall pick had the opportunity to be featured in content with current and former NBA stars. In a span of four days during Draft Week, Fultz posted photos with Tracy McGrady, Kenny Smith and John Wall, leveraging their social media following as well as his own. The post with Wall alone had over 64K likes and nearly 500 comments within the first 24 hours. Woven through these posts were two pieces with two NBA partners; Samsung and JBL. What was interesting about these two partners posts was how they showcased both sides of Fultz. Through the Samsung video with McGrady, Fultz speaks to the former All-Star about his goals in the NBA, while JBL features a video spot in which Fultz takes the audience to his home in Maryland, speaks of his music choices and how he spent his time leading up to the draft. The two videos proved successful by showcasing not only Fultz’s on-court ambitions, but also giving current and new fans a glimpse into his personality and passions off the court. If there is one takeaway from Fultz’s expansive approach to social over the past few months, it’s that an athlete’s social media habits and engagement strategies not only can pivot on a dime, but should pivot based on the moments they are looking to create with fans. Post-declaring, Fultz’s social media content has become significantly more focused on giving access to the person behind the player, resulting in continued spikes of engagement with his fans. These examples show not only the opportunity to engage fans in a very different way but also the type of content fans are really seeking, which can be validated in Fultz’s engagement numbers. As Summer League begins, the opportunity exists for all of these prospects to look at how they evolve their content and share more of their personal stories with fans. Over the next few months, they all have the opportunity to create more meaningful moments to share with their fans before their next big moment: the opening night of the 2017-18 NBA season.